The first “star” visible at night and the last to disappear in the morning, Venus is the brightest body in our sky after the Sun and Moon. Known as the “Shepherd's Star” in ancient times, Venus is nevertheless a true planet. Observed at night through a telescope, Venus shines a slightly yellowish white. This is actually due to its thick cloud cover, which reflects the Sun's light and conceals the surface, explaining why Venus has long been a mystery. It wasn’t until the 1960s that we really started to explore Venus. Powerful Earth-based radars pierced the clouds to provide us with our first topographical data on the planet’s size, surface relief and craters. Venus was the first planet to be visited by spacecraft, with the launch of the Mariner 2 probe in 1962. Between then and 1989, some 20 probes—including Mariner, Pioneer Venus, Venera and Vega—passed, orbited and even landed on the surface of Venus. The Soviets made about 10 successful landings, gathering data and analysing samples. In June 1985, a pair of balloons released by space probes Vega 1 and 2 drifted for 2 days through Venus’ atmosphere, taking numerous measurements. In 1989, the US probe Magellan took images of more than 90% of the planet’s surface, while its altimetry radar provided us with a series of relief maps. Cassini’s flyby of Venus in 1998 and 1999 aimed to observe lightning flashes in its atmosphere but detected nothing. 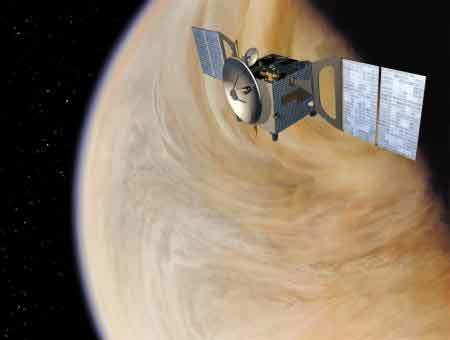 In 2006, the European probe Venus Express will make a detailed analysis of Venus’ atmosphere. Levels of heat and atmospheric pressure on Venus are so high that no lander has ever survived on its surface for more than an hour. …you wouldn’t be able to see very far through the thick atmosphere.